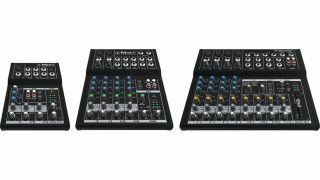 Mackie's new Mix5, Mix8 and Mix12FX. Mackie is a familiar name in the mixer world, but we've never previously seen it release models that are quite as affordable as those in the new Mix Series. Starting at just $70, these compact devices are designed for smaller, simpler applications, but promise not to skimp on sound quality. There are three models - Mix5, Mix8 and Mix12FX - each offering a slightly different blend of I/O, EQ and routing options. All of the mixers promise low-noise preamps, while an all-metal chassis is also part of the deal. As its name suggests, the Mix12FX also adds 12 integrated effects. "Not every application is complex. Sometimes you just need to get the audio from point A to point B, but that doesn't mean you should have to sacrifice on quality," commented Matt Redmon, Mackie Sr Product Manager. "That's why we've given users a new choice - an affordable mixer series with the Mackie stamp of approval, so users on a budget never have to compromise." The Mackie Mix Series mixers are shipping imminently, with US MRSPs being set at $70 for the Mix5, $110 for the Mix8 and $160 for the Mix12FX. You can find out more about each model on the Mackie website.